Leah Francis competes in the 100 meter hurdles during Division III finals at Jesse Owens Stadium in Columbus on Saturday. Emily Borchers of Russia runs the 3200 on Saturday in Columbus. Lauren Heaton runs the 1600 relay event for Russia. 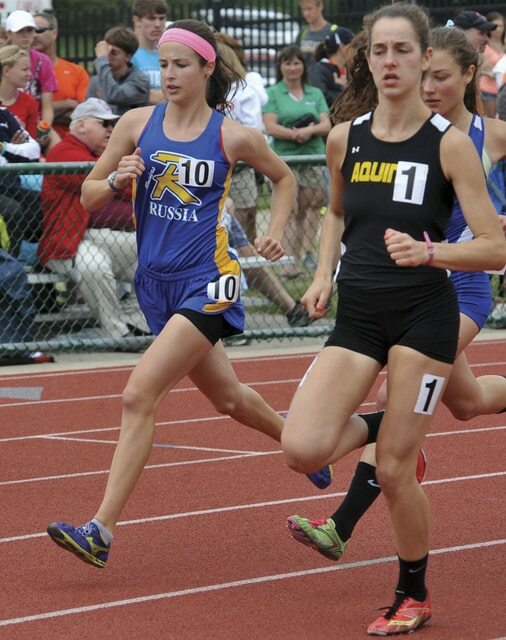 Russia’s Molly Kearns passes an opponent in the 3200 race. RUSSIA — When Russia hurdler Leah Francis thinks back to her freshman season, it is hard to grasp what has taken place since. The senior finished her career at the Division III state track and field championships with a third-straight high finish, even if it was just short of what she had hoped for at the Jesse Owens Stadium track on the OSU campus. After finishing fourth as a sophomore and junior, Francis was second in the 100 hurdles Saturday in 15.30. Maddy McDermott of Rittman won in 14.95. During the race, Francis in lane 5 — saw McDermott in lane 4 out in front of her. Russia junior Lauren Heaton found herself in a loaded field in trying to defend her state title in the 400. Heaton finished sixth in a time of 58.75. The Lady Raiders got two top 10 finishes in the 3,200. Emily Borchers finished seventh in 11:23.50 after running in the top three in the first half of the race. Junior Molly Kearns finished 10th in 12:03.0. Kearns hopes to be back next year. Francis and Borchers closed their careers by teaming with Heaton and Grace York for eighth place in the 1,600 relay in 4:08.28. The Raiders had come in with the ninth fastest qualifying time. And finish off an amazing three years with Russia track.